Distributed Replicated Block Device or DRBD is a free network storage solution software. A kernel module together with a management application in user space with a script serves the function of a a block device on a productive (primary) server in real time to another (secondary) server to reflect it. This method is used to acheive high availability (HA) in the Linux environment and thus can achieve a good availability of various services. Alternatives to this are distributed file systems is GlusterFS. Distributed Replicated Block Device or DRBD will write all the requests over the network transmitted to the second server. Only when the second server has returned the successful write operation to the first server, the application of these signals end the write process (this technique is comparable to a RAID 1 using TCP / IP). If the first server fails, it is reported as inactive. By a server monitoring software such as heartbeat, the second server can take over the function of the first server and continue working with the same data. Each Distributed Replicated Block Device or DRBD component (locally known as a partition) has a status, which may be either primary or secondary. Between all the systems DRBD creates a connection from the local partition to a virtual device / dev / drbd X, which can not be addressed directly. Write accesses to the primary system are low-level block device (partition) and simultaneously propagated to the secondary system. The secondary system then transmits the data to its own local low-level block device. All read requests are always carried out locally. If the primary system fails, a cluster management process makes the secondary system to the primary system state. If the former primary system is available again, this after a resynchronization device data is usually generate to avoid any unnecessary downtime, it serves to continue to run as a secondary system, but can also be placed in the primary status. The algorithm operates by the DRBD synchronization efficiently so that the changed data blocks need to be resynchronized again only during the failure. Conventional computer cluster systems usually use some kind of shared memory that is used for the cluster resources. However, this approach has a number of disadvantages that is bypassed by DRBD. Shared memory / shared storage typically bring a single point of failure within itself, since both cluster systems are from the same shared memory. 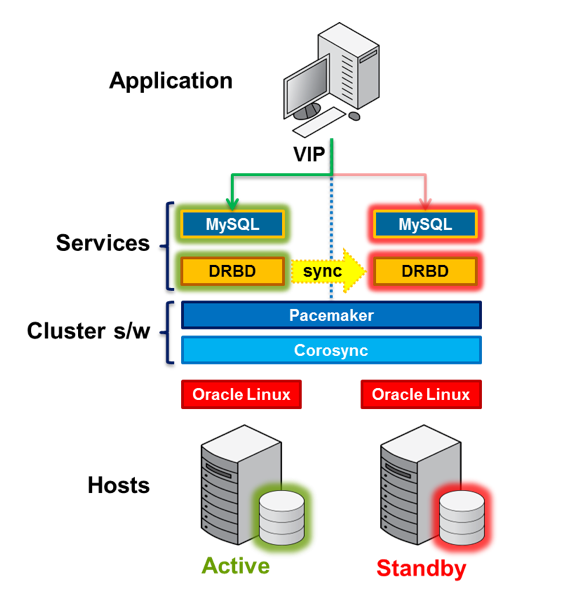 When using DRBD there is no such factor present here, since the required cluster resource to be replicated locally and not on a possibly corresponding shared memory. However, one can work in modern SAN solutions with mirroring capabilities that eliminate these previously unavoidable faults. Now DRBD integrates with virtualization softwares such as Xen, and has support for load-balancing. This Article Has Been Shared 6004 Times! Open Source Cloud Architecture not only has the offering of being of lesser cost setup, it has more security, more development and updates are expected from it. Cite this article as: Abhishek Ghosh, "Distributed Replicated Block Device or DRBD," in The Customize Windows, April 25, 2013, April 21, 2019, https://thecustomizewindows.com/2013/04/distributed-replicated-block-device-or-drbd/.